You might have noticed that the Professional Web Presence (PWP) website has a new look and feel. 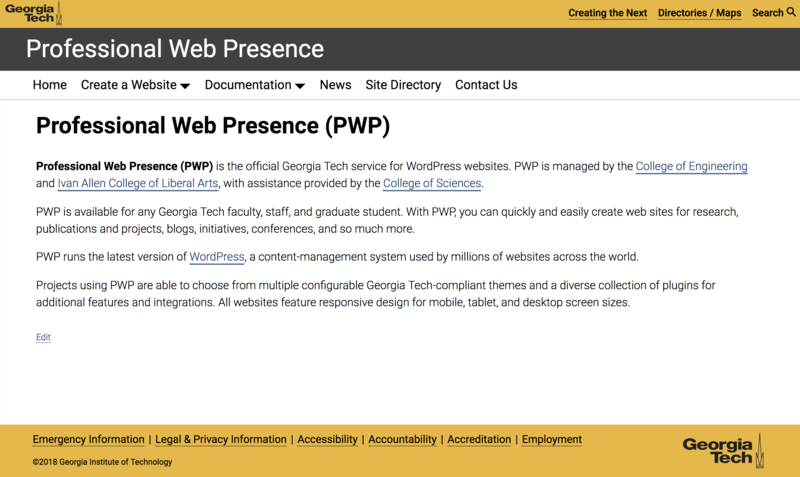 It’s not just you – PWP has introduced a new Georgia Tech theme to prepare for a campus-wide web redesign. Introducing – Georgia Tech v3 Theme! Developed by the Ivan Allen College of Liberal Arts, the Georgia Tech v3 Theme implementation follows decisions made by Georgia Tech’s Institute Communications regarding an upcoming rebrand. And we want PWP websites to be the first to experience the new look. Expanded Visibility and Customization for Site Title and Parent/Grandparent Unit Names and URLs – great for websites placed under a unit or department. Minimized Header/Footer Presence – new Georgia Tech-recommended branding leaves more room for your content to shine. The Georgia Tech v3 Theme is available for any PWP website to use today! To switch themes, navigate to your Dashboard and locate the new theme under ‘Appearance->Themes’. Please note that customizations such as widgets will need to be re-organized after any new theme selection. Later in 2018, all new PWP websites will leverage the Georgia Tech v3 Theme as the default theme!